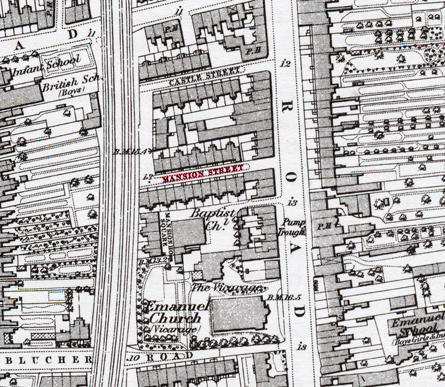 By 1911 Charles Harris and family had moved from Pomfret Road Loughborough Junction to Camberwell. They now lived at 35 Mansion Street Camberwell. Unfortiunately their daughter Florence Lyle Harris died aged just 4 years old in 1904. Charles and Annie's son Charles Lionel Harris married Emily Jane Hall at Camberwell in 1904. They then lived in the same house as his parents, and over the next 7 years had 3 children. 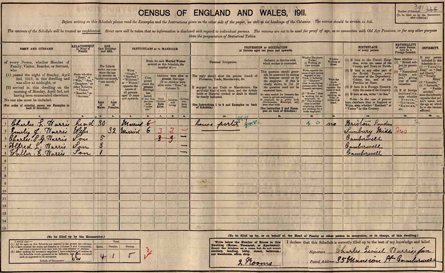 Charles Sidney G Harris was born 1906, Alfed Lionel Harris was born 1908, and Walter Edward Harris was born 1910. 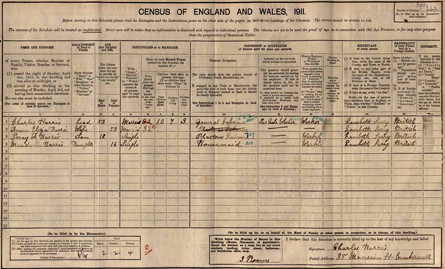 The above census images show both families living at 35 Mansiion Street. The left image shows Charles, his wife Annie, and children Percy aged 18, and Maude 16. The census records that in 32 years of marriage, the couple had had 10 children, 3 of which had died, and 7 were still alive. One of these children is Charles Lionel Harris who is shown in the right Hand image. 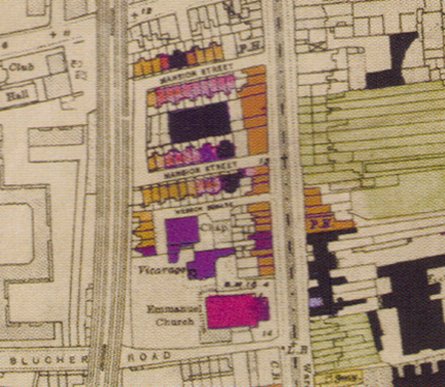 The maps below show the area in 1871 (left) and 1946 (right). The area was completely redeveloped in the 1960's with no trace remaining of Mansion Street.